A WELLNESS program being developed by Rosebud Secondary College could lead the way for suicide prevention across Victoria. 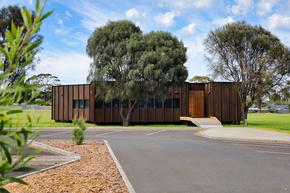 The program, being rolled out at Rosebud Secondary College, includes mindfulness training for teachers and students and the creation of an on-site Wellness Pavilion that would also be available for community use. The Rosebud program fits a number of criteria within the suicide prevention strategy announced by Premier Daniel Andrews in 2016. It is being developed on the Mornington Peninsula, which has the worst suicide rate in the State and it involves a school. A key part of the government’s strategy includes running preventive programs in schools. The school and wider community are working hard to raise money for, and awareness about, the project. On Tuesday 14th July 2014 we were treated to two excellent speakers – both passionate about assisting others to achieve success. Ingrid Maynard aka The Sales Dr shared 5 important keys to authentically serving your clients, then Rosebud Secondary College Assistant Principal Geoff Seletto followed with his view on the importance of the planned Wellness Centre that is due to be built in 2016. Keep abreast of the progress when you like our Facebook page. President Libby and Past Pres. Lee then presented Geoff with a cheque for the balance of our $50,000 pledge toward the establishment of the centre, which will primarily benefit the students, and also serve the local community out of school hours. Bentleigh Secondary College’s wellbeing programs address the strengthening of emotional, academic and social health of all students often targeting programs at various year levels. These include Safe Partying, Sexual Health, Stress Management, Body Image, Anger Awareness, Civic Rights, Calmer Classrooms and Responsibilities and Goal Setting. The Head of Wellbeing facilitates educational assessments, counselling, family and academic supports and referrals to specialist assistance. Find out more about this great initiative by visiting their website. The Mindfulness Festival, held on Saturday 28th November at Boneo Maze, featured great speakers including Craig Hassed and Geoff Toogood, a local cardiologist, who spoke of his personal experience with depression. Michael Wittingslow’s generous offer to host the event at Boneo Maze resulted in the attendees having access to numerous stalls focusing on Mindfulness, Yoga, meditation and healthy nutrition, as well as the fun activities available regularly at the maze.